Each time that they visit the house of grandma Cristina, who was Febe’s stepmom, they come away with some random object, whether it materializes in their vision or they’re led to it by the residual memories of a disquieting dream. Today it’s a set of twelve embroidered napkins once as white as they’re now yellowed, once as clean and starched as they’re now damp and limp in Celso’s hands. ​Febe thinks back to her second dinner at her then-fiancé’s parents’ house. And once more her confusion is a yarn of doubts or a strip of film that whirs, ignites, and burns, consumes the image. That night, she remembers: at first there were seven people. And by the end there were eight. It’s not that Febe failed to notice someone’s arrival, she was alert, hoping to make an impression on her future in-laws, fiancé, and guests. So it was odd but she held her tongue. She felt it would have been too brash to speak up, as if she could sabotage the path she’d worn out of her own stilted, stifling house. It’s just, when the seven guests—she counted them by name and by topic of conversation—stood from the table for coffee and digestives, there were eight of them seated there. She counted three times at least to be sure it wasn’t the effect of the wine or the thrill of her favorite dress, but there was undoubtedly an extra person. And much that she strained for the rest of the party, she never identified who among those present had sprouted suddenly like a fleshy bud in a body’s familiar texture. Who of them was the person of a sudden presence that apparently went unnoticed? But as much as these recollections, murky, wave through Febe, she’s attentive to what happens around her. Febe’s eyes—like a lens—seek, find, focus, film, and edit. ​In the car, on the way back, her thighs bear the vessel draped in purple velvet. Febe lifts the cloth slightly and warns, now that her husband has stopped at the first light, that the liquid is jostling the viscera. She sways into one of her moments, nothing or no one concerning her then. As always she comes back. Once home, Celso walks around the car and opens the door for Febe who, setting foot on the sidewalk, leads the procession. Her husband in tow, Febe climbs the stairs as if she held a newborn in her arms, as if home from the hospital. Now in the study, she makes her way between the table, the spaceship wasps and chairs. ​They close the door behind them, unconscious of their hurry to leave the room. They close the door without thinking twice about the small keyhole Larca will one day spy through, blocked slightly, imperceptibly. The winter sun and the habitual waft of dust remain inside there, but a vibration thins and the atmosphere is new. ​There is a human heart the size of a fist inside of a jar. On the bookcase, for anyone to see, with every bit the brilliance of madness. Color of the underside of a snake, infected eye cells, a glass bottle puffed with smoke. The hue lights like iris, like full spectra, even brighter if one only considers the cement this bit of flesh, out of place among the living, should be buried beneath. Its fate: to beat another pulse. For now, Larca’s veins will be the only warm flow, in dreams, to retrace tissues laminated by time. After dinner, Febe and Celso have another look. She takes the jar and places it on a different shelf, stepping back to see. Unconvinced, she returns it to the third. He, from the door, taking a breather, makes himself a wall. ​In their room they get ready for sleep. Dark now, each lights a lamp on his or her side of the bed and gets into the resultant bright bubble revealing only their hands, their books, and their mouths. Febe is the first to shut hers off, and darkness swallows her with a click. After twenty minutes or so Celso notices he’s been overtaken in his reading by the insomnia of his book. Almost without moving he grabs it and leaves it on his night stand. The same with his glasses. Then he guides his hand towards the switch and disappears by the same click, like a specter’s quiet laugh. ​For a while now Larca’s father’s chest has been an empty container. He inherited a hardware store, a matter that doesn’t interest him in the least, and a heart that fascinates and weighs on him equally. Asleep, his ribs expand with his breath to a thickness as clean as an empty tool shed, so as he lies there and his daughter watches him quietly at the foot of the bed, a clang of hammers is heard, bolts and nails turning, rolling, and falling noisily against one side when he tosses and turns half asleep, half anxious, completely afloat inside the weightless capsule of his sadness. 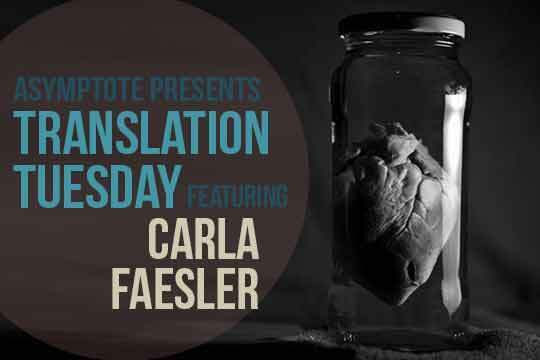 Carla Faesler’s poetry has often challenged genre descriptions, not only in the form of prose poetry but also as visual and conceptual art. She has written four books of poetry, Mixcóatl (1996), No tú sino la Piedra (1999), Anábasis maqueta (2003), and Catábasis Exvoto (2010), as well as the novel Formol (2014). She was awarded the Premio Nacional de Literatura Gilberto Owen for Anábasis maqueta. Carla Faesler was born in Mexico City, where she currently lives. Sections of Catábasis Exvoto have appeared in translation by Karen Lepri in journals such as Gulf Coast and Aufgabe. Adam Greenberg is a recent graduate of Brown University’s MFA in creative writing. His poetry has recently appeared, or is forthcoming in Poor Claudia, Yalobusha Review, and the Brooklyn Review. He lives in Boston, MA where he teaches classes in writing and literature.